Persistent exposure to cognate Ag leads to the functional impairment and exhaustion of HIV-specific CD8 T cells. Ag withdrawal, attributable either to antiretroviral treatment or the emergence of epitope escape mutations, causes HIV-specific CD8 T cell responses to wane over time. However, this process does not continue to extinction, and residual CD8 T cells likely play an important role in the control of HIV replication. In this study, we conducted a longitudinal analysis of clonality, phenotype, and function to define the characteristics of HIV-specific CD8 T cell populations that persist under conditions of limited antigenic stimulation. Ag decay was associated with dynamic changes in the TCR repertoire, increased expression of CD45RA and CD127, decreased expression of programmed death-1, and the emergence of polyfunctional HIV-specific CD8 T cells. High-definition analysis of individual clonotypes revealed that the Ag loss-induced gain of function within HIV-specific CD8 T cell populations could be attributed to two nonexclusive mechanisms: 1) functional improvement of persisting clonotypes; and 2) recruitment of particular clonotypes endowed with superior functional capabilities. Several observations suggest that Ag-specific CD8 T cells are important for the control of HIV-1 infection (1–4); it has also been demonstrated that HIV-specific CD8 T cell responses in long-term nonprogressors and in HLA-B*27+slow progressors exhibit a wide array of effector functions (5, 6). However, chronic Ag persistence at high levels leads to dysfunction and exhaustion, and HIV-specific CD8 T cells are therefore frequently characterized by an inability to produce cytokines, compromised proliferative capacity, and impaired cytotoxic activity (7–13). Despite the widespread usage of highly active antiretroviral therapy (HAART), relatively little is known about its impact on HIV-specific CD8 T cells. The frequency of such cells declines rapidly upon the initiation of HAART (14–16). Nevertheless, persisting HIV-specific CD8 T cells could still play an important role in controlling residual viral replication. Similarly, despite the fundamental significance of perpetual viral evolution in relation to disease pathogenesis, relatively little is known about the impact of immune escape on HIV-specific CD8 T cells. Of note, de novo variant-specific CD8 T cell responses can emerge, suggesting that some of these escape mutations can still be processed and presented to T cells (17). Furthermore, it is known that responses specific for wild-type epitopes wane over time as a result of diminished antigenic drive, yet this process does not lead to the extinction of CD8 T cells that recognize wild-type epitopes. Thus, CD8 T cells with wild-type epitope specificity persist in some form and appear to play an important role in the maintenance of escape mutations within the viral quasispecies. Strong evidence for this assertion comes from HIV and SIV transmission studies, in which selected escape mutations rapidly revert to optimize viral fitness in the absence of the presenting MHC class I (MHCI) molecule and remain relatively stable in the presence of the appropriate restriction element as a result of the induction of wild-type–specific CD8 T cell populations by viral revertants (18–21). It was recently documented that both HAART and viral sequence diversification lead to the emergence of polyfunctional HIV-specific CD8T cells (22, 23). Rehr et al. (22) demonstrated that, after 24 wk of HAART, HIV-specific CD8 T cells gradually recovered their cytokine secretion capacity, displayed increased expression of CD28 and CD127, and downregulated programmed death-1 (PD-1). Furthermore, Streeck et al. (23) showed that Ag decay over time decreased the exhausted phenotype of HIV-specific CD8 T cells, whereas monofunctionality decreased slightly for responses directed against escaped epitopes. In another study, it was shown that Ag decay resulting from the emergence of escape mutations or the institution of HAART was associated with significantly decreased coexpression of CD38 and PD-1 on HIV-specific CD8 T cells, whereas a rise in viral load resulted in increased CD38/PD-1 coexpression (24). However, the characteristics of the clonal TCR repertoire under conditions of limited antigenic stimulation remain unknown. Although TCR repertoire studies have been performed in the context of several acute and persistent viral infections, including HIV-1 (25–29), longitudinal studies that aim to characterize the evolution of the HIV-specific CD8 T cell repertoire and further couple HIV-specific CD8 T cell clonotypes to functional profiles have been limited (30). In this study, we hypothesized that Ag decay would enhance the functional quality of HIV-specific CD8 T cell responses by influencing the Ag-specific CD8 T cell repertoire. Accordingly, to better define the qualitative features of HIV-specific CD8 T cells during Ag withdrawal, we undertook a comprehensive analysis of HIV-specific CD8 T cell responses in the face of Ag decay because of the initiation of HAART or the emergence of viral epitope mutations in a cohort of eight HIV-infected individuals. In each case, we conducted a longitudinal examination of the clonal composition, phenotypic status, and functional profile of CD8 T cell populations specific either for autologous stable epitopes at time points prior to, during, and after HAART or for autologous wild-type epitopes and, where present, the corresponding variant epitopes before and after viral escape. For comparative purposes, CMV-specific CD8 T cell responses were studied in parallel. The data provide clear evidence for dynamic changes in the TCR repertoire associated with an Ag loss-mediated functional reconstitution within the HIV-specific CD8 T cell compartment, which can be attributed to two distinct mechanisms: 1) functional improvement of persistent clonotypes; and 2) recruitment of particular clonotypes endowed with superior functional capabilities. Eight HIV-infected subjects were enrolled from Hospital Notre Dame (Montreal, QC, Canada). All were male, aged between 22 and 49 y (mean, 38 y).The estimated date of infection in each case was based on clinical history, p24 ELISA, and Western blot HIV test analysis. Longitudinal cryopreserved PBMC samples were available from each subject, and written informed consent for sample use was obtained in all cases. Subjects 1, 2, 3, 4, and 8 started HAART during the course of the study; subjects 5, 6, and 7 were treatment naive during the course of the study. Subjects 1, 2, and 3 started HAART during early-phase HIV-1 infection (1 mo postinfection); subjects 4 and 8 started HAART 6 mo after the estimated date of infection. All five subjects stopped HAART voluntarily. Initial immunological characterization comprised HLA genotyping and screening for HIV epitope-specific CD8 T cell responses using fluorescent peptide–MHCI (pMHCI) tetrameric complexes, based on autologous viral sequences; CMV-specific CD8 T cells were only detected in subjects 1, 2, 4, and 8. For bulk analysis of autologous viral populations, amplification and sequencing of the near complete HIV genomes were performed as described previously (31). For clonal sequencing, viral RNA was extracted using the QIAamp viral RNA minikit (Qiagen) and reverse transcribed using the SuperScript One-Step RT-PCR kit (Invitrogen). Amplification was performed using sets of outer primers specific for each region of interest. Products were then further amplified in a nested PCR using specific sets of inner primers. Amplicons were ligated into pGEM-T Easy vector (Promega), and cloning was performed by transformation of competent DH5-α Escherichia coli. For each amplicon, 24 white colonies were picked, screened using standard M13 primers, and then sequenced. All sequences were analyzed using Codon Code Aligner Version 3.0 (Codon Code). Soluble biotinylated pMHCI monomers were manufactured by the Canadian Network for Vaccines and Immunotherapeutics tetramer core facility (Montreal, QC, Canada) as previously described (32) and tetramerized with fluorochrome-conjugated streptavidin at a 4:1 molar ratio. The following pMHCI tetramers were produced: HLA-A*0201-FLGKIWPSHK (HIV Gag p2p7p1p6 FL10, residues 70–79) and HLA-A*0201-NLVPMVATV (CMV pp65 NV9, residues 495–503) for subject 1, HLA-A*0301-RLRPGGKKR (HIV Gag p17 RR9, residues 20–28) and HLA-B*0702-TPRVTGGGAM (CMV pp65 TM10, residues 417–426) for subject 2, HLA-B*0801-FLKEKGGL (HIV Nef FL8, residues 90–97) for subject 3, HLA-B*0702-TPGPGVRYPL (HIV Nef TL10, residues 128–137) and HLA-B*0702-TPRVTGGGAM (CMV pp65 TM10, residues 417–426), for subject 4, HLA-B*0702-FPQGEAREL (HIV Pol FL9, residues 8–16), a novel epitope predicted on the basis of binding algorithms and autologous viral sequence data, for subject 5, HLA-A*0301-RLRPGGKKK (HIV Gag p17 RK9, residues 20–28) for subjects 6 and 7, and HLA-B*0801-GEIYKRWII (HIV Gag p24 GI9, residues 127–135), and for subject 8, HLA-B*0702-TPRVTGGGAM (CMV p65 TM10, residues 417–426). Tetrameric complexes with the variant epitope HLA-A*0301-RLRPGGRKR were also produced for experiments conducted with samples from subject 7. Thawed PBMC were stained with PE- or allophycocyanin-conjugated pMHCI tetramers for 15 min at 37°C and then washed and surface stained with panels constructed from combinations of the following mAbs: 1) anti–CD3-Pacific Blue, anti–CD8-PerCPCy5.5, anti–CCR7-FITC, anti–CCR7-PECy7, anti–CD27-Alexa700, anti–CD27-Qdot605, anti–CD28-FITC, anti–CD45RA-allophycocyanin-Cy7, anti–CD127-Pacific Blue, anti–CD127-PECy5, anti–PD-1-allophycocyanin, anti–PD-1-PECy7, and anti–IFN-γ-allophycocyanin (BD Biosciences); and 2) anti–CD8-ECD and anti–Vβ6-2-PE (Beckman Coulter). Live/dead fixable Aqua (Invitrogen) was used to exclude dead cells from the analysis. Data were collected using an LSRII flow cytometer (BD Biosciences) and analyzed with FlowJo software (version 8.7.3; Tree Star); compensation was performed electronically, and the Boolean platform was used to create arrays of different marker combinations. Subsequent analysis was performed using SPICE software (version 5.1; http://exon.niaid.nih.gov/spice/) (33). Cryopreserved PBMC were thawed and rested for 1 h in R10 (RPMI 1640 medium supplemented with 10% FCS, antibiotics, and l-glutamine) prior to stimulation with cognate peptide. Stimulated samples were prestained with the corresponding PE-conjugated pMHCI tetramers for 15 min at 37°C. After addition of the costimulatory mAbs anti-CD28 and anti-CD49d (1 μg/ml each; BD Biosciences), monensin (0.7 μg/ml; BD Biosciences), brefeldin A (10 μg/ml; Sigma-Aldrich), and anti–CD107a-Alexa680, cells were stimulated with the relevant autologous peptides at a concentration of 5 μg/ml for 6 h at 37°C. Costimulation alone and staphylococcal enterotoxin B (1 μg/ml; Sigma-Aldrich) were used as negative and positive controls, respectively; in all cases, cells in the negative control tubes were stained with pMHCI tetramers at the end of the stimulation period. After a single wash, the cells were stained with anti–CD3-Pacific Blue and anti–CD8-ECD and then washed again prior to fixation/permeabilization (2% paraformaldehyde/0.05% saponin) and intracellular staining with anti–IL-2-FITC, anti–TNF-Alexa700, and anti–IFN-γ-allophycocyanin (BD Biosciences). Live/dead fixable Aqua (Invitrogen) was used to exclude dead cells from the analysis. Ag sensitivity was assessed using a similar protocol for the measurement of intracellular IFN-γ after stimulation with a 10-fold dilutional series of cognate peptide from 10 to 0.0001 μg/ml; experiments were performed in triplicate, and the EC50 was defined as the peptide concentration that yielded 50% of the maximum IFN-γ response. For all experiments, data were acquired immediately using an LSRII flow cytometer (BD Biosciences) after a final wash step and fixation with 2% paraformaldehyde. All live lymphocyte events were collected, and files were analyzed with FlowJo software (version 8.7.3; Tree Star) after electronic compensation. Functional capacity was determined after Boolean gating and subsequent analyses were performed using SPICE software (version 5.1; http://exon.niaid.nih.gov/spice/) (33). Values used for the analysis of proportionate response representation were background subtracted. For RNA-based clonotype analysis, HIV-specific CD8 T cells were stained with cognate pMHCI tetramer and sorted viably to >98% purity by flow cytometry directly into 1.5-ml Sarstedt tubes containing 100 μl RNAlater (Applied Biosystems). mRNA was extracted using the Oligotex mRNA mini kit (Qiagen) and subjected to a template-switch anchored RT-PCR using a 3′ T cell receptor beta (TRB) C region primer as described previously (34). Amplicons were ligated into pGEM-T Easy vector (Promega) and cloned by transformation of competent DH5-α E. coli. At least 50 white colonies were amplified by PCR for each sorted population using standard M13 primers and then sequenced. For DNA-based clonotype analysis, distinct functional CD8 T cell subsets were sorted to >98% purity by flow cytometry after intracellular cytokine staining. DNA was extracted by lysis of sorted T cells in 100 μg/ml proteinase K (Boehringer) for 1 h at 56°C and then 10 min at 95°C. A hemi-nested multiplex touchdown PCR was then performed using previously described TRBV/TRBJ primer combinations and PCR conditions (35). Amplicons were then subcloned using the pGEM-T vector system and sequenced. All sequences were analyzed using Sequencher (Gene Codes); nonfunctional sequences were discarded from the analysis. The ImMunoGeneTics nomenclature is used throughout the paper. Statistical analysis was performed using the two-tailed Student paired t test for the data shown in Figs. 2 and 3; the Wilcoxon rank-sum test was used for the analyses shown in Fig. 4. p < 0.05 was considered significant. The similarity of the TCR repertoire between time points and estimation of the reference similarity were assessed using the Morisita–Horn coefficient, calculated according to the method developed by Venturi et al. (36). The size of all samples was reduced to the size of the smallest sample, and the Morisita–Horn similarity indices were computed as if a standard number of 26 TCR sequences had been obtained in all samples. The randomization step consisted of randomly drawing a sample size of 26 in the Ag high (Ag), Ag low (NoAg), and Ag rebound (ReAg) states and calculating the similarity measures for each sample pair of Ag/NoAg and Ag/ReAg. The distribution median resulting from 10,000 random samplings of the two reduced sample pairs was used to represent the Morisita–Horn similarity indices between the Ag/NoAg and between the Ag/ReAg subsets. We also determined whether the similarities for the observed TCR sample pairs were lower than expected by chance, if the sample pairs had been randomly assigned from the same TCR population. The reference similarity was generated under the null hypothesis that the Ag and NoAg sets were randomly assigned from the same TCR population. The TCR sequences of Ag and NoAg states were first pooled, and then, two sets of 26 TCR sequences were randomly drawn from the pooled populations to calculate the similarity measures. The median of this distribution provided a reference similarity for the two TCR repertoire sets, namely HIV Ref and CMV Ref. The clonal structures, functional profiles, and phenotypic properties of HIV-specific CD8 T cell populations were studied longitudinally in eight HIV-infected individuals under conditions of both high and low Ag load, as inferred from measurements of plasma viremia and autologous viral epitope sequencing, with low levels of antigenemia reflecting HAART-mediated suppression of HIV replication and/or immune-driven mutational escape. Where feasible, CMV-specific CD8 T cell responses were studied in parallel. Fig. 1A depicts the time points studied in each subject and the autologous viral epitope sequences for the specificities studied at each time point. Periods of reduced Ag load, because of effective HAART and/or viral escape, are indicated by diagonal hatching. Supplemental Fig. 1 displays the viral load trajectories for each subject together with concomitant CD4 and CD8T cell counts and all viral epitope sequences. For subjects 1–4, there was no evidence of mutation within any of the targeted epitopes throughout the study period (Fig. 1A, Supplemental Fig. 1B). For subjects 5–8, autologous plasma viral sequencing revealed directional changes in antigenic sequences over time (Fig. 1A, Supplemental Fig. 1B), consistent with epitope escape through mutation at MHCI anchor positions and/or putative TCR contact residues (subjects 5, 7, and 8). In subject 5, we observed E8K and L9F mutations in the Pol FL9 epitope. In subject 6, 100% of analyzed sequences acquired a K9Q mutation in the Gag p17 RK9 epitope over the course of the study. In subject 7, a dual K7R and K9R mutation was observed in the Gag p17 RK9 epitope. However, at the final time point of the study (26 mo), the majority of viral sequences contained the K9R mutation either alone or in combination with additional mutations; this indicates replacement of the intermediate viral quasispecies with an optimal immune escape virus. In subject 8, I3V and R6K mutations emerged in the Gag p24 GI9 epitope at 17 mo. Of note, subject 8 initiated HAART after the first time point of study and exhibited an undetectable plasma viral load at 7 mo. Representative dual pMHCI tetramer stainings are shown in Fig. 1B. Consistent with Ag load decay, we observed a progressive decline of HIV-specific CD8 T cell frequencies in all eight subjects after initiation of HAART and/or the emergence of targeted epitope escape mutations (Fig. 1C). In contrast, the frequencies of CMV-specific CD8 T cells remained largely constant (37). Of note, the frequencies of HIV-specific CD8 T cells all increased with Ag rebound after cessation of HAART in subjects 1–4. Virological and immunological characteristics of the study cohort. A, Schematic representation of viremia and Ag sequence variation over time. A color code is assigned for each of the three main Ag load categories studied; high Ag load pre-HAART or pre-escape (black), low Ag load on HAART or after viral escape (diagonal lines), and Ag load rebound after cessation of HAART (gray). For subjects 1–4, the diagonal lines represent the administration of HAART. For subjects 5–7, the diagonal lines represent epitope escape. For subject 8, the diagonal lines represent the combination of HAART and epitope escape. Month 0 indicates the estimated date of infection. Orange circles indicate the time points at which blood samples were analyzed for HIV-specific and CMV-specific CD8 T cell responses in each subject. Black arrows indicate the time points from which viral sequences were obtained. The targeted epitopes are depicted in each case; longitudinal epitope sequence variation is also displayed. B, Representative tetramer costaining showing the frequencies of HIV-specific and CMV-specific CD8 T cells longitudinally in subject 2. C, Longitudinal frequencies of HIV-specific and CMV-specific CD8 T cells in all eight subjects. Bars represent the following epitope-specific CD8 T cell populations: HLA-A*0201-FLGKIWPSHK (HIV Gag p2p7p1p6) and HLA-A*0201-NLVPMVATV (CMV pp65) in subject 1, HLA-A*0301-RLRPGGKKR (HIV Gag p17) and HLA-B*0702-TPRVTGGGAM (CMV pp65) in subject 2, HLA-B*0801-FLKEKGGL (HIV Nef) in subject 3, HLA-B*0702-TPGPGVRYPL (HIV Nef) and HLA-B*0702-TPRVTGGGAM (CMV pp65) in subject 4, HLA-B*0702-FPQGEAREL (HIV Pol) in subject 5, HLA-A*0301-RLRPGGKKK (HIV Gag p17) in subjects 6 and 7 (KKK and RKR represent wild-type and variant epitopes in subject 7, respectively), and HLA-B*0801-GEIYKRWII (HIV Gag p24) and HLA-B*0702-TPRVTGGGAM (CMV pp65) in subject 8. The black, diagonal line and gray bars indicate pre-HAART or pre-escape, HAART or escape, and post-HAART time points, respectively. Flow cytometric analysis using a panel of cell surface markers allowed us to assess the maturation status (monitored by the expression of CCR7, CD27, and CD45RA; Fig. 2A, 2C), exhaustion profile, and survival capacity (quantified by the expression of CD28, CD127, and PD-1; Fig. 2B, 2D) of HIV-specific CD8 T cell populations longitudinally in seven subjects. The full dataset is shown in Supplemental Fig. 2. In agreement with previous results, HIV-specific CD8 T cells generally expressed either a CCR7−CD27+CD45RA− or a CCR7−CD27−CD45RA− phenotype (38). Frequencies of CCR7−CD27+CD45RA− cells (medium blue) declined as levels of Ag decreased, with the exception of subject 4, whereas the proportion of CD45RA+ cells (dark blue) increased for all subjects. This increase in CD45RA expression comprised both CCR7−CD45RA+ cells, reflecting differentiation within the memory compartment, and CCR7+CD45RA+ cells, a phenotype that typifies naive or stem-cell memory(Tscm) cells (39).Fig. 2E represents the significant increase of HIV-specific CD8 T cells expressing CD45RA between the first time point, where Ag load was high, and the second time point obtained after Ag decline for all subjects studied (p = 0.005). Similarly, and concomitantly with the decay in Ag level, the frequency of CD28+/−CD127−PD-1+ CD8 T cells (medium pink) decreased in all subjects, whereas frequencies of CD28+/−CD127+PD-1+/−CD8 T cells (purple) increased in all subjects, except subject 4. The significant increase in CD127 expression and decrease in PD-1 expression on HIV-specific CD8 T cells between the first time point studied and the second time point after Ag decline is shown in Fig. 2F and 2G (p = 0.006 and p = 0.011, respectively). In contrast, CMV-specific CD8 T cells displayed a more terminally differentiated phenotype (CCR7−CD27−CD45RA−/+); these cells were mostly CD28−CD127+/−PD-1− and did not show consistent phenotypic changes during the study course (Supplemental Fig. 2B, 2D). Collectively, these results indicate that HIV-specific CD8 T cells lose expression of the exhaustion marker PD-1 and upregulate CD127 expression levels under conditions of reduced Ag load, which could allow them to persist within the memory compartment (40); moreover, the increase in CD45RA expression indicates that decreased levels of Ag lead to enhanced differentiation within the specific CD8 T cell compartment as a whole. Phenotypic changes in HIV-specific CD8 T cell populations under conditions of reduced Ag load. A and C, Maturation status of HIV-specific CD8 T cells at each time point, based on the expression of CCR7, CD27, and CD45RA. After the gates for the three markers were created on tetramer+ cells, the Boolean gate platform was used to create eight different combinations. The colored slices in each pie represent different phenotypic combinations: CD45RA+ with other combinations (dark blue), CD45RA− with other positive combinations (medium blue), and CCR7−CD27−CD45RA− (light blue). B and D, Exhaustion and survival capacity of HIV-specific CD8 T cells at each time point, based on the expression of CD28, CD127, and PD-1. The colored slices in each pie represent different phenotypic combinations: CD127+ with other combinations (purple), CD127-PD-1+ with other combinations (medium pink), and CD127−PD-1− with other combinations (light pink). In A and B, which depict representative analyses for subject 1, the bars on the x-axis demonstrate the frequencies of cells belonging to a particular combination. The numbers under the pies indicate the time points studied. Black, light gray, and dark gray indicate pre-HAART or pre-escape, HAART or escape, and post-HAART time points, respectively. E–G, Percentage of tetramer+ cells expressing CD45RA (E), CD127 (F), and PD-1 (G) at the first time point studied (high Ag load) and the second time point obtained after Ag decay (low Ag load). m, Month. To determine whether changes in Ag levels, mediated either by intervention with HAART or immune-driven viral escape, led to significant changes in the functional profile of HIV-specific CD8 T cells, we undertook a comprehensive flow cytometric analysis of cytokine production (IFN-γ, TNF, and IL-2) and degranulation (CD107a) in all eight subjects (Fig. 3, Supplemental Fig. 3). We used Boolean analysis to create an array of different combinations of T cell functions that allowed the enumeration of cells with various degrees of functionality. Fig. 3A shows representative flow cytometric data for CD107a mobilization and IFN-γ, TNF, and IL-2 production by HIV-specific or CMV-specific CD8 T cells in the presence of cognate peptide stimulation. We observed dynamic changes in the functionality of HIV-specific CD8 T cells in all subjects studied as levels of cognate Ag decayed (Fig. 3B, 3C); the full dataset is shown in Supplemental Fig. 3A. For all eight subjects, HIV-specific CD8 T cell responses at the early time points of high viremia were predominantly mono- or bifunctional, mainly composed of IFN-γ+ and/or CD107a+ cells. Interestingly, the functional profile of HIV-specific CD8 T cells for each epitope was characterized by the acquisition of several functions following Ag load decay as shown by a significant increase in the frequencies of cells exhibiting three functions (CD107a+IFN-γ+TNF+; orange; p = 0.01) and a decay in mono- or bifunctional cells (yellow and green; Fig. 3B–D). Of note, after Ag rebound because of cessation of HAART, the frequency of HIV-specific CD8 T cells exhibiting three or four functions (orange or red) decreased in subjects 1–4. No significant changes in functionality were apparent for the corresponding CMV-specific CD8T cell populations (Supplemental Fig. 3B). Indeed, CMV-specific CD8 T cells were consistently polyfunctional, exhibiting up to four (CD107a+IFN-γ+TNF+IL-2+), three (CD107a+IFN-γ+TNF+), or two (IFN-γ+TNF+ and CD107a+IFN-γ+) functions. Thus, HIV-specificCD8 T cells display enhanced polyfunctional profiles coincident with the decay of Ag, whether as a result of effective HAART or the emergence of escape mutations, consistent with previous reports (22, 23). Functional changes in HIV-specific CD8 T cell populations under conditions of reduced Ag load. 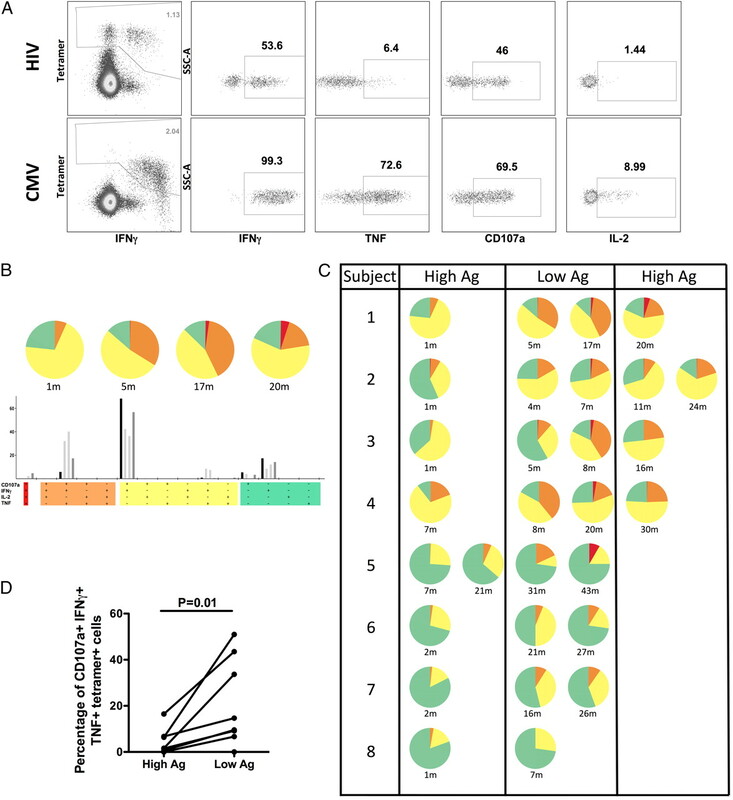 A, Representative example of simultaneous multifunctional assessment of HIV-specific and CMV-specific CD8 T cells by multiparametric flow cytometry at a given time point. Cells were stimulated for 6 h with the corresponding cognate peptide before intracellular staining; anti-CD107a was present throughout the assay to capture degranulating cells as described in Materials and Methods. Percentages of function+tetramer+ cells are shown. Plots are gated on CD3+CD8+ cells. Dead cells were excluded from the analysis using a viability dye. B, Multifunctional assessment of HIV-specific CD8 T cell responses by multiparametric flow cytometry performed longitudinally for subject 1. After the gates for four functions were created (CD107a, IFN-γ, TNF, and IL-2), the Boolean gate platform was used to create an array of 15 different positive combinations. The pies represent the functional profiles of HIV-specific CD8 T cell populations. The slices within each pie represent different functional combinations: 4+ (red), 3+ (orange), 2+ (yellow), and 1+ (green). The bars on the x-axis represent the response frequency for each combination. Numbers under the pies indicate the time points studied. Black, light gray, and dark gray indicate pre-HAART or pre-escape, HAART or escape, and post-HAART time points, respectively. C, Longitudinal flow cytometric analysis of HIV-specific CD8 T cell function for all eight subjects. D, Percentage of tetramer+ cells expressing CD107a, IFN-γ, and TNF under conditions of high and low Ag load; the first time point before Ag decay and one time point after Ag decay, respectively, are shown. m, Month. To determine whether the changes in phenotype and functionality that followed the decay of Ag levels could be attributed to alterations in the TCR repertoire of HIV-specific CD8 T cells, we performed a comprehensive clonotypic analysis of HIV-specific and CMV-specific CD8 T cell populations using a template–switch-anchored RT-PCR to amplify all expressed TRB gene products without bias as described previously (34, 41). All TCR sequences from this longitudinal analysis are shown in Supplemental Table I. Fig. 4A summarizes the dynamic evolution of the major clonotypes, color-coded to match the sequences shown in Supplemental Table I. Dynamic longitudinal changes in clonotypic composition were observed within HIV-specific CD8 T cell populations, concomitant with changes in Ag load. Several clonotypes persisted throughout the duration of the study, whereas others could no longer be detected. Furthermore, we observed the emergence of new clonotypes during periods of HAART administration and after the emergence of escape mutations. Persistent clonotypes showed quantitative changes as a consequence of Ag load decay. In subject 1, for example, the TRBV6-2/CASSYVGGDGYT/TRBJ1-2 clonotype, which was the second most frequent clonotype in the pre-HAART repertoire (27.7%), increased in frequency during therapy and became the prevalent clonotype after cessation of HAART and viral load rebound (87.6%). In subjects 6 and 8, an even more dramatic shift was observed, with a monoclonal repertoire emerging after immune escape; the detected TRBV13/CASSPGLDGEQY/TRBJ2-7 clonotype for subject 6 and the TRBV9/CASSTKAGGLADTQY/TRBJ2-3 clonotype for subject 8 were not present at the pre-escape time point. In subject 5, we observed a major bias in the TCR repertoire specific for the HLA-B*0702-FPQGEAREL epitope, with preferential usage of TRBV18 and TRBJ2-5 combined with the presence of a discernable RGR motif in theCDR3 loop. Moreover, clonotype TRBV18/CASSPRGREETQY/TRBJ2-5, which was a subdominant clonotype at 7 and 21 mo (13.4 and 16.1%, respectively), became dominant at 31 and 43 mo (100 and 98%, respectively). Of note, the dominant clonotype at 7 and 21 mo, TRBV18/CASSPRGRDETQY/TRBJ2-5, could no longer be detected within the tetramer+ pool at 31 and 43 mo. Hence, in the context of the E8K and L9F mutations, we observed the selection of a single clonotype from a heavily biased repertoire that persisted over time. In subject 7, the TCR repertoires specific for the wild-type (RLRPGGKKK) and variant (RLRPGGRKR) epitopes were analyzed. Responses to both epitopes were detected and decayed over time (Fig. 1C). The TCR repertoire specific for the wild-type epitope remained stable. The dominant clonotype specific for the variant epitope that emerged under low levels of Ag at 16 mo (TRBV10/CASSDTLNTEAF/TRBJ1-1) was not detected in either repertoire prior to immune escape; however, it was detected as a subdominant clonotype in the wild-type epitope-specific repertoire postescape. Other cross-reactive clonotypes were also detected at 2 and 16 mo (TRBV28/CASRDSSYEQY/TRBJ2-7 and TRBV24-1/CATSDDGTPNNEQF/TRBJ2-1), and both repertoires contained mutually exclusive clonotypes. Thus, immune escape through mutation can impact the clonotypic repertoire of wild-type epitope-specific CD8 T cell populations. Evolution of the TCR repertoire in the context of Ag decay. A, Longitudinal clonotype frequencies for HIV-specific and CMV-specific CD8 T cell responses. The major persistent clonotypes are represented for each subject and color coded to match those shown in Supplemental Table I. Under the x-axis, the black, diagonal line, and gray bars indicate pre-HAART or pre-escape, HAART or escape, and post-HAART time points, respectively. B, Morisita–Horn coefficients for HIV-specific and CMV-specific CD8 T cell populations before and after Ag decay (Ag and NoAg, respectively). The reference similarity for HIV-specific and CMV-specific CD8 T cell repertoires was generated under the null hypothesis that the Ag and NoAg sets were randomly assigned from the same TCR population (HIV Ref and CMV Ref, respectively). The similarity between Ag and NoAg time points was significantly lower than the reference similarities for HIV-specific, but not for CMV-specific CD8 T cell repertoires. C, Morisita–Horn coefficients for HIV-specific CD8 T cell responses comparing the time point before Ag decay (Ag) to either time points with low Ag load (NoAg) or time points after Ag rebound because of cessation of HAART (ReAg) for subjects 1, 2, 3, and 4. The similarity between time points before Ag decay and Ag rebound (Ag/ReAg) was significantly lower than between time points before and after Ag load decrease (Ag/NoAg). Fig. 4B displays the similarity indices for TCR sequences between time points with high and low Ag load for HIV-specific and CMV-specific CD8 T cell populations calculated using the Morisita–Horn coefficient for all subjects (36). All values were generated in comparison with the first time point when Ag levels were high. HIV-specific CD8 T cell repertoires exhibited drastic changes as the Morisita–Horn coefficients were <1, except for subject 3. For all four subjects in whom CMV-specific responses were detected, the Morisita–Horn coefficient was equal or close to 1, indicating a conserved repertoire throughout the study period. The TCR repertoire similarity between the high and low Ag load time points was significantly lower than the reference similarities for HIV-specific CD8 T cells (p = 0.001), suggesting that the HIV-specific CD8 T cell repertoire population was highly dynamic upon decrease of Ag load. For subjects 1–4, the Morisita–Horn coefficients ranged from 1 to 0.56 for the HAART-induced low Ag load time points studied (Fig. 4C). After Ag rebound, these coefficients were significantly lower compared with those observed between high and low Ag load states (p = 0.04), indicating a further turnover of the HIV-specific TCR repertoire upon Ag rebound (Fig. 4C). Collectively, these results indicate that the HIV-specific TCR repertoire is highly dynamic and that fluctuations in Ag levels (decay and rebound) lead to changes in clonal dominance by selection of particular persistent clonotypes and the emergence of new HIV-specific CD8 T cell clonotypes. In three subjects, we were able to dissect the functional characteristics of individual persistent clonotypes, based on the availability of specific TCRVβ mAbs. The TRBV25-1/CASSVLRAAF/TRBJ1-1 clonotype dominated the HLA-B*0801–restricted FL8-specific CD8 T cell population in subject 3 at the 1-mo (high Ag load, 97.7%) and 8-mo (low Ag load on HAART, 100%) time points. This clonotype displayed a change in phenotype between the pre-HAART and HAART time points, predominantly because of increased expression of CD45RA (dark blue) and CD127 (purple) and a decrease in PD-1 expression (medium pink) (Fig. 5A). Gain of function between these two time points was also apparent, as evidenced by a substantial increase in the frequencies of CD107a+IFN-γ+TNF+ (3+) cells, from 1.6 to 33.6% of the responding population (Fig. 5A). However, this gain in functionality under conditions of limited antigenic stimulation was not sufficient to maintain the TRBV25-1/CASSVLRAAF/TRBJ1-1 clonotype after Ag rebound, because it was replaced by a new clonotype post-HAART (Fig. 5A, Supplemental Table I). Thus, a decrease in Ag load can lead to phenotypic changes and increased functionality at the clonal level. Gain of function and persistence of individual HIV-specific CD8 T cell clonotypes under conditions of limited antigenic stimulation. A, Phenotypic and multifunctional assessment of HLA-B*0801–restricted FL8-specific CD8 T cells from subject 3 before (1 mo) and during (8 mo) HAART. The dominant TRBV25-1/CASSVLRAAF/TRBJ1-1 clonotype showed changes in phenotype and gained functionality after Ag decay. B, Simultaneous phenotypic and multifunctional assessment of bulk and TCRVβ6-2+ HLA-A*0201–restricted FK10-specific CD8 T cells before and during HAART in subject 1. Tetramer+ cells composed of all clonotypes did not display an altered functional profile after Ag decay, whereas epitope-specific TCRVβ6-2+ CD8 T cells gained functionality within the same time frame. The experiment shown in this figure was performed at a different time than the experiment presented in Fig. 3 without costimulation to compare total tetramer+ cells and tetramer+TCRVβ6-2+ cells. No differences in phenotype were observed between tetramer+TCRVβ6-2+and tetramer+TCRVβ6-2− CD8 T cells at 17 mo under HAART. C, Clonotypic composition of functional subsets within the HLA-B*0701–restricted FL9-specific CD8 T cell response at the 21 mo pre-escape time point for subject 5, as determined by DNA-based sequence analysis. Pie colors represent the different functional combinations that were sorted: 3+ (orange), 2+ (yellow), and 1+ (green). The boxes show the CDR3 amino acid sequence as well as the TRBV and TRBJ usage of the different functional cells. At 21 mo, the tetramer+ CD8 T cell population was composed of one dominant clonotype (blue) and one subdominant clonotype (orange), both expressing TRBV18. All functional cells correspond to the subdominant clonotype at 21 mo, which became dominant after Ag decay. No phenotypic differences were observed between functional and nonfunctional epitope-specific CD8 T cells at 21 mo. The clonotypic and functional analysis from subject 1 supported this observation and suggested another mechanism for the gain of function after Ag decay (Fig. 5B). Clonotype TRBV6-2/CASSYVGGDGYT/TRBJ1-2 persisted throughout the study period, although its relative frequency progressively increased such that it became the dominant clonotype during and after HAART (58.7% at 17 mo and 87.6% at 20 mo, respectively). Functionality was assessed both within the total HLA-A*0201–restricted FK10-specific CD8 T cell population encompassing several clonotypes and within the TCRVβ6-2+subset, identified by mAb staining; this analysis was performed at time points that preceded and followed Ag decay (1 and 17 mo, respectively) when the TRBV6-2/CASSYVGGDGYT/TRBJ1-2 clonotype (in blue) was subdominant and dominant, respectively (Fig. 5B). At 1 mo, tetramer+ CD8 T cells were predominantly IFN-γ+. Interestingly, the functional profile of TCRVβ6-2+ CD8 T cells was similar to that of the total tetramer+ CD8 T cell population at this time point. After Ag decay on HAART at 17 mo, the functional profile of the tetramer+ CD8 T cell population remained predominantly monofunctional. In contrast, TCRVβ6-2+ CD8 T cells acquired novel functions, demonstrated by an increase in the proportion of CD107a+IFN-γ+TNF+ (3+) cells. At 17 mo, no differences in phenotype were observed between the TCRVβ6-2+ cells and the total FK10-specific CD8 T cell population (Fig. 5B). Thus, fluctuations in Ag load can lead to clonotype-specific functional changes. Furthermore, clonotypes that display enhanced functionality can become numerically dominant under conditions of limited antigenic stimulation. To extend these observations, experiments were performed to determine whether clonotypes with superior functional profiles were endowed with a greater capacity to persist. The clonotypic and functional data from subject 5 allowed us to address this question (Fig. 5C). Functional improvements in the HLA-B*0702–restricted FL9-specific CD8 T cell population after Ag decay at 31 and 43 mo were described previously (Fig. 3). The TCR repertoire of the HLA-B*0702–restricted FL9-specific CD8 T cell population was composed of a single clonotype, TRBV18/CASSPRGREETQY/TRBJ2-5, at these time points. To determine the functional compartment within which this specific clonotype resided at the 21-mo time point, before Ag decay, we sorted four different functional populations from the HLA-B*0702–restricted FL9-specific CD8 T cell population and performed a DNA-based clonotypic analysis as described previously (35). The following four functional CD8 T cell populations were sorted: 3+ (IFN-γ+TNF+IL-2+), 2+ (IFN-γ+TNF+ and IFN-γ+IL2+), and 1+ (IFN-γ+). The TRBV18/CASSPRGREETQY/TRBJ2-5 clonotype was present in all four functional populations sorted; in contrast, the dominant TRBV18/CASSPRGRDETQY/TRBJ2-5 clonotype prior to escape was not detected (Fig. 5C). We also performed a phenotypic analysis of FL9-specific CD8 T cells at the 21-mo time point with or without stimulation and compared the tetramer+ cells on the basis of IFN-γ production. No significant phenotypic differences were detected between the responding and nonresponding cells that could differentiate the TRBV18/CASSPRGREETQY/TRBJ2-5 clonotype (Fig. 5C). Thus, functionally superior clonotypes can persist preferentially under conditions of limited antigenic stimulation. HIV-specific CD8 T cells from subjects 5, 7, and 8 (Table I) were stimulated with the corresponding cognate peptides to determine whether increased functional sensitivity contributed to the selective persistence of HIV-specific TCR clonotypes under conditions of limited antigenic stimulation. Intracellular cytokine staining was performed to assess functionality at different peptide concentrations, with the underlying hypothesis being that clonotypes with the highest levels of functional sensitivity would be enriched in the persisting CD8 T cell population. In all cases, the EC50 values for IFN-γ production by tetramer+ CD8 T cell populations decreased over time, concomitant with the emergence of escape mutations within the corresponding cognate epitopes. Thus, the functional sensitivity of persistent Ag-specific CD8 T cells increased in the presence of low Ag levels in these three subjects, suggesting that this parameter confers individual clonotypes with a selection advantage in vivo in the presence of limited Ag load. In this study, we investigated the impact of declining Ag load on the persistence, phenotypic status, and functionality of HIV-specific CD8 T cell populations at the clonal level. A marked degree of clonotypic turnover was observed within HIV-specific CD8 T cell populations as a consequence of Ag decay after the initiation of HAART or upon the emergence of viral epitope mutations. Furthermore, new cognate clonotypes emerged under conditions of limited Ag load. In contrast, the contemporaneous CMV-specific CD8 T cell repertoires remained stable. Ag decay led to changes in the phenotype of HIV-specific CD8 T cells and to the acquisition of novel functions; CMV-specific CD8 T cells remained polyfunctional throughout and maintained their phenotypic profiles. HIV-specific CD8 T cell clonotypes that persisted over time exhibited functional and phenotypic changes that paralleled alterations in Ag load. Moreover, particular clonotypes that became dominant after Ag decay were selected for their higher functional capacities. Overall, these data provide clear evidence of a functional reconstitution within the HIV-specific CD8 T cell compartment upon Ag decay, which can be attributed to two nonexclusive mechanisms: 1) gain of function by persistent clonotypes; and 2) selection of clonotypes with high levels of functional sensitivity. After Ag decay, we observed increases in CD127 and CD45RA expression and decreases in PD-1 expression within HIV-specific CD8 T cell populations, consistent with previous reports (22, 23, 42–45). However, these changes were not drastic; indeed, HIV-specific CD8 T cells remained predominantly CD27+. The functional improvement of HIV-specific CD8 T cell populations observed after Ag decay was primarily due to the acquisition of TNF production. Of note, the loss of TNF production has been described as an early functional marker of exhaustion (10). Furthermore, CMV-specific CD8 T cell populations in the current study exhibited similar functional and phenotypic properties throughout all time points studied. Thus, the gain of TNF production is limited to the HIV-specific CD8 T cell compartment and can be attributed to Ag decay. It should be noted that we cannot comment directly on changes in cytolytic activity because CD107 mobilization is an indicator of degranulation and may not reflect the expression of key cytolytic molecules, which show substantial heterogeneity within CD8 T cell populations (46, 47). Nonetheless, it is intriguing to postulate that the improved functionality of wild-type epitope-specific CD8 T cells observed after viral escape might not only be the consequence of Ag decay but also could contribute to the generation and maintenance of HIV escape mutants. 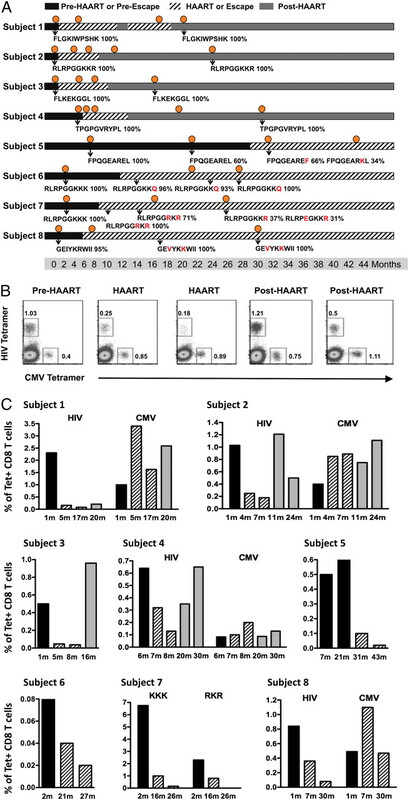 In addition, although the functional improvement of HIV-specific CD8 T cells was partially sustained after the discontinuation of HAART, this was not associated with improved control of viral replication in the four subjects studied in this context. Given that a previous report has suggested such an association in a small number of individuals (48), further work is warranted to determine the conditions under which these parameters can be linked. HIV-specific CD8 T cell repertoires tend to be oligoclonal and skewed during chronic HIV-1 infection, likely as a consequence of several factors including avidity-based selection (41), the loss of high-avidity clonotypes (49), and a relative lack of precursor T cell diversity because of decreased thymic output (50). In the current study, we observed that reduced antigenic stimulation resulted in dynamic HIV-specific CD8 T cell repertoire changes, including the emergence of new clonotypes, modifications of clonal dominance, and reductions in the overall numbers of constituent clonotypes. Of note, we observed a degree of cross-reactivity between wild-type and variant epitopes in subject 7. In this scenario, TCR repertoire alterations were minimal, consistent with a degree of ongoing antigenic drive mediated by the variant epitope. Thus, cross-reactivity can modify the impact of epitope mutation on the wild-type Ag-specific CD8 T cell repertoire. The emergence of new clonotypes after Ag decay was observed after the institution of HAART and following the emergence of viral epitope mutations. However, the origins of these clonotypes remain to be elucidated. One possibility is that these clonotypes exit secondary lymphoid organs as Ag load decreases. De novo priming of new clonotypes is also known to occur during persistent viral infections (51) and may even be enhanced by improved CD4 T cell help during HAART and residual low-level Ag persistence (52, 53). With the application of deep sequencing approaches to the evaluation of mutational immune escape, it is becoming clear that wild-type Ag frequently persists to some extent within complex mixtures of viral variants, and it is probable that such viral quasispecies establish an equilibrium with the residual cognate CD8 T cell population by priming new functional clonotypes (54). Finally, the apparent emergence of new clonotypes may simply represent a relative increase in the frequency of previously primed memory CD8 T cell clonotypes that were harbored below the level of detection at earlier time points (55). The application of more sensitive methodologies for TCR repertoire evaluation could help to resolve these issues (56). Our experiments also allowed us to determine whether the overall restoration of functional capacity within HIV-specific CD8 T cell populations was the consequence of a functional improvement at the single-cell level or the preferential survival of polyfunctional CD8 T cells. Overall, the data indicate that both mechanisms contribute to the observed functional restoration within HIV-specific CD8 T cell populations under conditions of limited antigenic stimulation. Thus, Ag decay, attributed to either effective HAART or the emergence of epitope mutations, led to a significant change in the TCR repertoire as a result of the selection of clonotypes with high levels of functional sensitivity. In addition, individual clonotypes were shown to undergo functional improvement under the same conditions. Consistent with these observations, Rees et al. (57) showed that Ag load in peptide-immunized mice shaped the CD4 T cell repertoire and that high Ag load led to the emergence of clonotypes with low levels of functional sensitivity. Moreover, it was reported previously that CD8 T cells with high levels of Ag sensitivity exhibited superior effector functions resulting in more efficient antiviral activity compared with CD8 T cells with poor Ag sensitivity (41, 58–63). In addition, Almeida et al. (6, 64) showed that epitope-specific CD8 T cell clones endowed with high levels of Ag sensitivity displayed superior functionality, proliferated more efficiently, and mediated more potent HIV-1–suppressive activity. Our data suggest that clonotypes with higher levels of Ag sensitivity could also have a superior capacity to persist in vivo, thereby highlighting the need to define optimal concentrations of Ag for the generation of long-lived memory CD8 T cell clonotypes with maximal antiviral efficacy. Collectively, these findings have implications for vaccination and lend support to immunotherapeutic strategies that aim to induce polyclonal responses under conditions of HAART (65). We thank Dr. Nicolas Chomont and Dr. Rabih Halwani for objective comments, Dr. Vanessa Venturi for advice, members of the Cleveland Immunopathogenesis Consortium for helpful discussions, and the Reseau Fonds de la Recherché en Santé du Québec Réseau Sida et Maladies Infectieuses for providing the samples used in this study. This work was supported by funds from the Canadian Institutes for Health Research, the Fonds de la Recherché en Santé du Québec Réseau Sida et Maladies Infectieuses, the National Institutes of Health (Grant IDPIDA028871-01), and the Office of Tourism, Trade, and Economic Development of Florida. D.A.P. is a Medical Research Council (U.K.) Senior Clinical Fellow.
. 1999. Control of viremia in simian immunodeficiency virus infection by CD8+ lymphocytes. Science 283: 857–860.
. 2000. Impaired function of circulating HIV-specific CD8+ T cells in chronic human immunodeficiency virus infection. Blood 96: 3094–3101.
. 2002. HIV-specific CD8+ T cell proliferation is coupled to perforin expression and is maintained in nonprogressors. Nat. Immunol. 3: 1061–1068.
. 2004. Memory CD8 T-cell differentiation during viral infection. J. Virol. 78: 5535–5545.
. 2001. Decay kinetics of human immunodeficiency virus-specific CD8+ T cells in peripheral blood after initiation of highly active antiretroviral therapy. J. Virol. 75: 6508–6516.
. 1999. Decay kinetics of human immunodeficiency virus-specific effector cytotoxic T lymphocytes after combination antiretroviral therapy. J. Virol. 73: 797–800.
. 2001. Cellular immune responses and viral diversity in individuals treated during acute and early HIV-1 infection. J. Exp. Med. 193: 169–180.
. 2005. De novo generation of escape variant-specific CD8+ T-cell responses following cytotoxic T-lymphocyte escape in chronic human immunodeficiency virus type 1 infection. J. Virol. 79: 12952–12960.
. 2005. 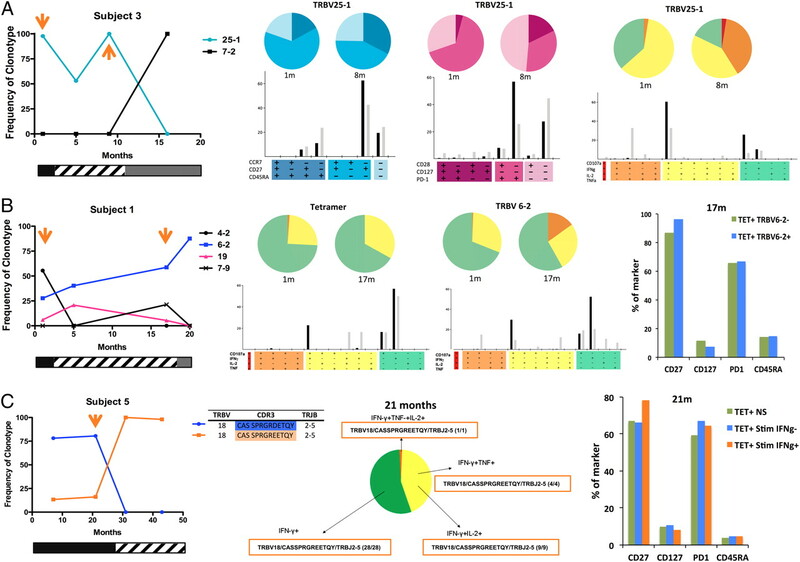 Dynamic immune responses maintain cytotoxic T lymphocyte epitope mutations in transmitted simian immunodeficiency virus variants. Nat. Immunol. 6: 247–252.
. 2004. Reversion of CTL escape-variant immunodeficiency viruses in vivo. Nat. Med. 10: 275–281.
. 2004. HIV evolution: CTL escape mutation and reversion after transmission. Nat. Med. 10: 282–289.
. 2008. Emergence of polyfunctional CD8+ T cells after prolonged suppression of human immunodeficiency virus replication by antiretroviral therapy. J. Virol. 82: 3391–3404.
. 2008. Antigen load and viral sequence diversification determine the functional profile of HIV-1–specific CD8+ T cells. PLoS Med. 5: e100.
. 2010. Impact of changes in antigen level on CD38/PD-1 co-expression on HIV-specific CD8 T cells in chronic, untreated HIV-1 infection. J. Med. Virol. 82: 358–370.
. 2006. Structural determinants of T-cell receptor bias in immunity. Nat. Rev. Immunol. 6: 883–894.
. 2007. The T cell repertoire in infection and vaccination: implications for control of persistent viruses. Curr. Opin. Immunol. 19: 294–300.
. 2009. Functional implications of T cell receptor diversity. Curr. Opin. Immunol. 21: 286–290.
. 2011. Dominant clonotypes within HIV-specific T cell responses are programmed death-1high and CD127low and display reduced variant cross-reactivity. J. Immunol. 186: 6871–6885.
. 2003. Primary infection of a male plasma donor with divergent HIV variants from the same source followed by rapid fluctuations in their relative frequency and viral recombination. AIDS Res. Hum. Retroviruses 19: 1009–1015.
. 2007. The clonal composition of human CD4+CD25+Foxp3+ cells determined by a comprehensive DNA-based multiplex PCR for TCRB gene rearrangements. J. Immunol. Methods 321: 107–120.
. 2008. Method for assessing the similarity between subsets of the T cell receptor repertoire. J. Immunol. Methods 329: 67–80.
. 2005. Repertoire, diversity, and differentiation of specific CD8 T cells are associated with immune protection against human cytomegalovirus disease. J. Exp. Med. 201: 1999–2010.
. 2011. Persistent survival of prevalent clonotypes within an immunodominant HIV gag-specific CD8+ T cell response. J. Immunol. 186: 359–371.
. 2008. High-programmed death-1 levels on hepatitis C virus-specific T cells during acute infection are associated with viral persistence and require preservation of cognate antigen during chronic infection. J. Immunol. 181: 8215–8225.
. 2007. Heterogeneity of effector phenotype for acute phase and memory influenza A virus-specific CTL. J. Immunol. 179: 64–70.
. 2007. CD8 single-cell gene coexpression reveals three different effector types present at distinct phases of the immune response. J. Exp. Med. 204: 1193–1205.
. 2008. Virological outcome after structured interruption of antiretroviral therapy for human immunodeficiency virus infection is associated with the functional profile of virus-specific CD8+ T cells. J. Virol. 82: 4102–4114.
. 2007. Selective depletion of high-avidity human immunodeficiency virus type 1 (HIV-1)-specific CD8+ T cells after early HIV-1 infection. J. Virol. 81: 4199–4214.
. 1998. Changes in thymic function with age and during the treatment of HIV infection. Nature 396: 690–695.
. 2005. HIV-infected individuals receiving effective antiviral therapy for extended periods of time continually replenish their viral reservoir. J. Clin. Invest. 115: 3250–3255.
. 2008. Low-level viremia persists for at least 7 years in patients on suppressive antiretroviral therapy. Proc. Natl. Acad. Sci. USA 105: 3879–3884.
. 2009. Ultradeep pyrosequencing detects complex patterns of CD8+ T-lymphocyte escape in simian immunodeficiency virus-infected macaques. J. Virol. 83: 8247–8253.
. 2008. Induction and evolution of cytomegalovirus-specific CD4+ T cell clonotypes in rhesus macaques. J. Immunol. 180: 269–280.
. 1999. An inverse relationship between T cell receptor affinity and antigen dose during CD4+ T cell responses in vivo and in vitro. Proc. Natl. Acad. Sci. USA 96: 9781–9786.
. 1996. Selective expansion of high- or low-avidity cytotoxic T lymphocytes and efficacy for adoptive immunotherapy. Proc. Natl. Acad. Sci. USA 93: 4102–4107.
. 2001. High-avidity CTL exploit two complementary mechanisms to provide better protection against viral infection than low-avidity CTL. J. Immunol. 166: 1690–1697.
. 2000. In vivo induction of a high-avidity, high-frequency cytotoxic T-lymphocyte response is associated with antiviral protective immunity. J. Virol. 74: 5769–5775.
. 2004. Hierarchies in cytokine expression profiles for acute and resolving influenza virus-specific CD8+ T cell responses: correlation of cytokine profile and TCR avidity. J. Immunol. 172: 5553–5560.
. 2006. Impact of HLA-B alleles, epitope binding affinity, functional avidity, and viral coinfection on the immunodominance of virus-specific CTL responses. J. Immunol. 176: 4094–4101.
. 2007. Rapid CD8+ T cell repertoire focusing and selection of high-affinity clones into memory following primary infection with a persistent human virus: human cytomegalovirus. J. Immunol. 179: 3203–3213.
. 2009. Antigen sensitivity is a major determinant of CD8+ T-cell polyfunctionality and HIV-suppressive activity. Blood 113: 6351–6360.
. 2010. New approaches to design HIV-1 T-cell vaccines. Curr. Opin. HIV AIDS 5: 368–376.